What do you get when you have a stupendous, concert experience with one of the greatest lineups benefitting an impactful cause? You get the remarkable We Can Survive concert! Everyone’s favorite music station, 97.1 AMP Radio along with Entercom, the number one creator of live, original, local audio content in the United States, teamed up for the 6th Annual We Can Survive concert (a Radio.com event) which took place on October 20, 2018 at the Hollywood Bowl in Los Angeles, California. The night could be described using one word: epic and it was so wonderful to see so many of the biggest musicians and terrific attendees gather together for an inspiring event. The We Can Survive concert benefitted the Young Survival Coalition (YSC), which is a brilliant organization that provides resources and outreach to young women who have been diagnosed with breast cancer. In fact, for every ticket sold, $2 was donated to help the YSC. Strength. Faith. Hope. Power. The We Can Survive concert celebrated all of those things and how music is an avenue for many to heal and have the encouragement to keep fighting. The scene was indeed an unforgettable one. The iconic Hollywood Bowl was filled with people wearing pink – whether it was pink shirts, pink leis, or pink jackets, everyone showed their support towards the Young Survival Coalition and National Breast Cancer Awareness Month. Each and every year the We Can Survive concert never fails to leave everyone speechless with a phenomenal lineup of spectacular performers. 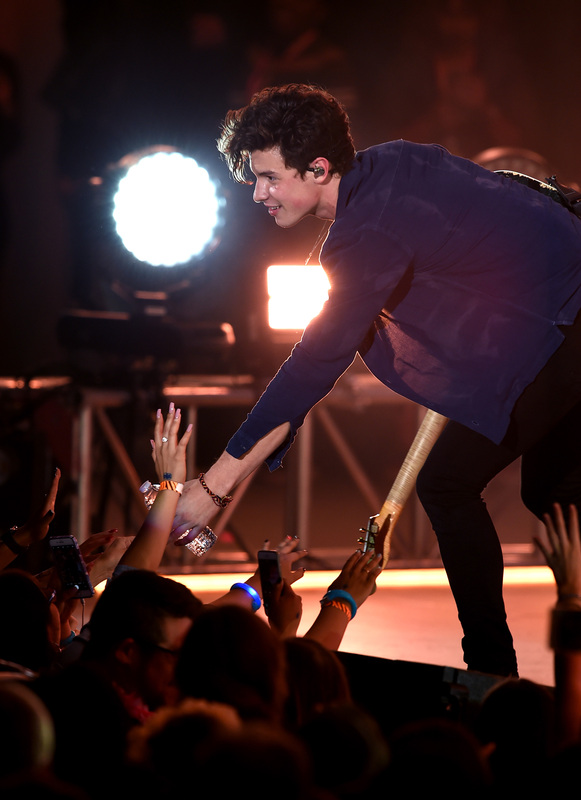 This year’s memorable concert featured performances by Shawn Mendes, G-Eazy, Charlie Puth, Meghan Trainor, Tyga, Ella Mai, NF, Khalid and Marshmello and they all gave attendees a concert they will never forget. The outstanding night kicked off with the one and only Ella Mai taking the stage. Mai brought some serious girl power vibes. Ella Mai wowed the crowd with her vocals and she sang her great songs including “Boo’d Up,” “Trip” and many others. Once the We Can Survive concert got started, it was back-to-back excitement with performances right after each other. 97.1 AMP Radio hosts came up on stage to introduce each artist. Rapper NF followed with a fantastic performance. NF brought his awesome raps and rhymes onto the stage as he performed his hit songs including “Let You Down,” “Lie,” “Green Lights,” “Why” and many others. Everyone’s location was definitely at the Hollywood Bowl because it was the most happening place to be in Hollywood! Next up was “Location” singer Khalid on the We Can Survive stage. Khalid was all smiles and brought some #goodvibes as he performed at the event. Khalid even showed off his super cute dance moves and seriously, he is one person that can always brighten up everyone’s day. The phenomenal Charlie Puth was next to take the stage. It goes without saying that Charlie Puth is an immensely talented and gifted musician and he mesmerized everyone during his set. Charlie Puth always exhibits professionalism in everything that he does and he engaged with all attendees while on stage to leave them even more so on Cloud 9. Not only did he exhibit his one-of-a-kind singing voice, but Puth also showed his talent in playing the keytar and piano. After the We Can Survive concert, Puth headed straight on a plane to Asia. Everyone’s lips were definitely moving and singing along once the gorgeous Meghan Trainor came on stage. Needless to say, she looked so beautiful and she even rocked pink hair to show her support towards breast cancer awareness. We absolutely love the pink hair on her – she looks stunning in anything and everything. Trainor sang a countless amount of her hit songs including “All About That Bass,” “No Excuses,” and “Let You Be Right” amongst many others. She totally slayed the stage! Shawn Mendes also brought Khalid back on stage to perform “Youth.” Everyone went crazy seeing these two highly-acclaimed artists together on stage! Tyga continued off the night with a sensational performance. He brought tons of energy onto the stage and had everyone jamming out. To add onto the many highlights of the event, Tyga even brought out Chris Brown onto the stage. Of course, the duo’s performance made everyone’s night extra special. Rap icon G-Eazy was next on stage. He was dressed to the nines and even sported a pink jacket for National Breast Cancer Awareness Month. Fans were screaming at the top of their lungs once G-Eazy came on stage and he surpassed everyone’s expectations with his stellar performance. He was even joined by Anthony Russo on stage. Last but certainly not least, Marshmello closed out the night with his magnificent performance. The unparalleled DJ truly blew everyone away with his set. There couldn’t have been a more perfect way to end the brilliant night than by seeing Marshmello on stage. Despite it being late at night, everyone at the We Can Survive concert was still ready to party thanks to Marshmello. He lit up the night as fireworks filled the stage. Marshmello shared a picture with Tyga and Chris Brown from the event as seen below on his Instagram account. Nothing can top how special of an experience the We Can Survive concert is. An exceptional lineup of performers while benefitting a terrific cause – what could possibly be better than that?! It’s so touching to see all of these extraordinary musicians and attendees come together to honor the admirable and strong women who suffer from breast cancer and continue to inspire us all daily. I, Alexisjoyvipaccess had the greatest honor of covering the 2018 We Can Survive concert and it definitely was one of the best concert experiences. Check out some more pictures below from 97.1 AMP Radio’s We Can Survive concert! 97.1 AMP Radio is a Radio.com station and Radio.com is a part of Entercom. Follow @RadioDotCom and @971AMPRadio on Twitter and Instagram and be sure to join in on the conversation by using #WeCanSurvive! Follow the Young Survival Coalition on Twitter: @YSCBuzz and on Instagram: @YoungSurvivalCoalition. Previous VIPAccessEXCLUSIVE: Jillian Rose Reed, Brooke Lewis And More Showed Their Support Towards Breaking The Chains’ Impactful Event With The IAEDP Foundation – RECAP Here! Next Article: Aracely Arambula, Becky G, Leslie Grace, Gloria Trevi And Roselyn Sanchez Bring Major Girl Power To The 2018 Latin American Music Awards As They Host This Year’s Renowned Award Show Airing Tomorrow, Oct. 25th!